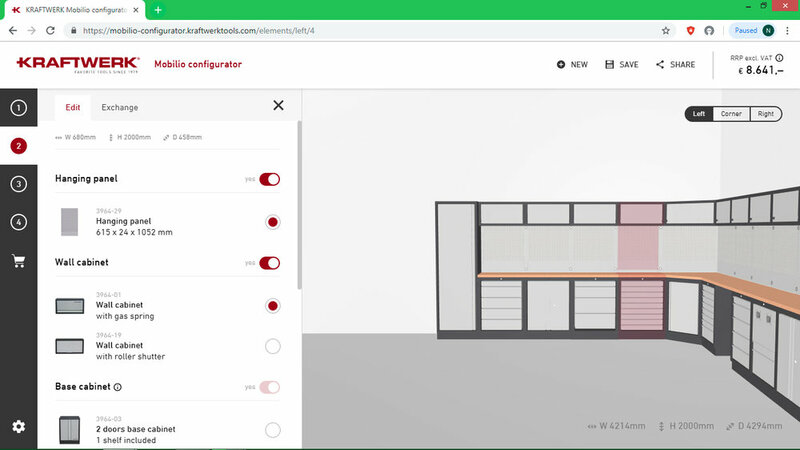 Kraftwerk Tools now offers you a web-based Mobilio Configurator. In need of a tailormade modular workshop equipment system? With our new tool you design and decide what goes in and what stays out of your Mobilio. It doesn't get any easier than this! The Mobilio Configurator allows you to customise your works space - using every element you could need as well as tools and accessories that fit the Mobilio system. 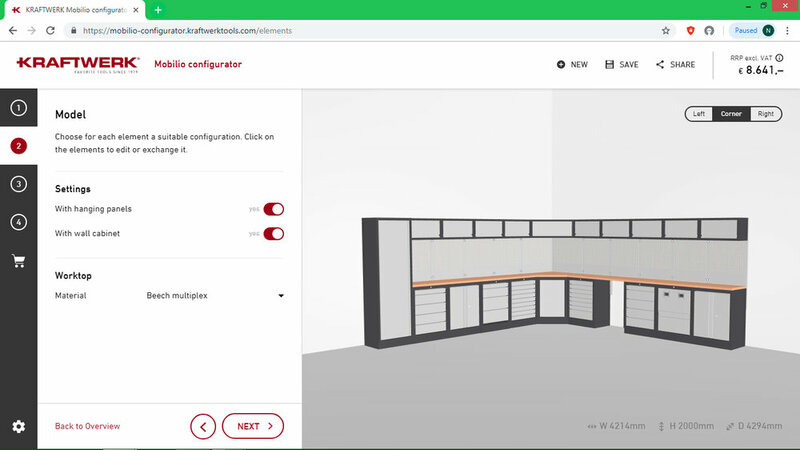 Each page of the configurator walks you through the process - allowing your customised design for your home garage or commercial workshop or manufacturing facility. You can create your own installation or start with one of our pre-configured systems - giving you a starting point to work from. There are options for Automotive, Electrician and General Tools - but, of course, you do not need to accept any of these - let your imagination run wild. And once you have planned your workspace (it may be to fill a wall, extend into a corner or as a completely stand alone option) you can then add in or swap out any items you want to change. The menu options allow you to pick any item from the Mobilio range and add or swap with items from your plan. All options are listed and the configurator will display the size of the installation so you can check this against you own measurements. All items are listed as part of the install for you to check against before confirming your design. Once you have completed your design you can then add tools from the Kraftwerk Range to fill the drawers and cupboards. All items available are compatible with the Mobilio system and fit neatly into the drawers ensuring ease of use and that all items are kept clean and tidy. Sets available include sockets, spanners, pliers, screwdrivers, cutting and measuring tools - all available in list form in the configurator. As well as a vast range of tools available, you can also specify a range of accessories, these include vices, storage bins, lighting, air-lines, hooks and additional shelving. All of these items are available within the configurator and once specified are added to your installation. Once you have completed your design, added your tool and accessory requirements and are happy with all you require the configurator provides a list of all individual items for you to check over and review. This will act as the basis of your quotation. You can then fill in your details and your design and quotation listing all items will be sent to you. PLEASE NOTE: Quotes at the moment are supplied in Euros - we receive a copy of your quotation and we will then contact you confirming UK Sterling prices and to check if there is anything else you need. The configurator does not work on mobile devices at the moment. When completing the form - please add your postcode in the box with your town/city details as the zip code box will not currently recognise a UK postcode - just place “00000” in the zip code box. Once we have your quotation we will then contact you to work with you to make your plan a reality. In addition to this note that we also offer survey and installations services for large industrial/commercial installs. We look forward to assisting you with your workshop requirements. The video below shows you how the Mobilio Configurator works.